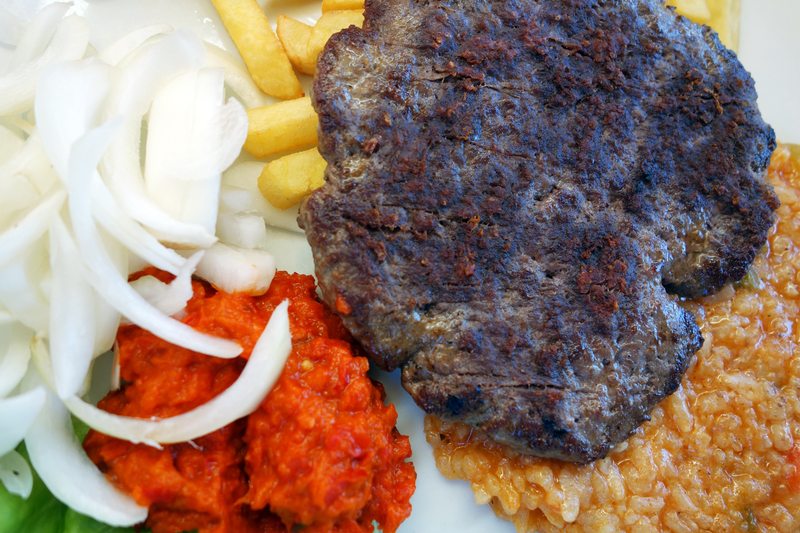 Another favorite fast food meat in Slovenia is Pljeskavica, often referred to endearingly as “Balkan burger.” Originally a Serbian dish, Pljeskavica can be found in pretty much any former Yugoslavian country. It’s a patty of ground pork and beef flavored with minced onion, garlic, salt and paprika and grilled over charcoal. 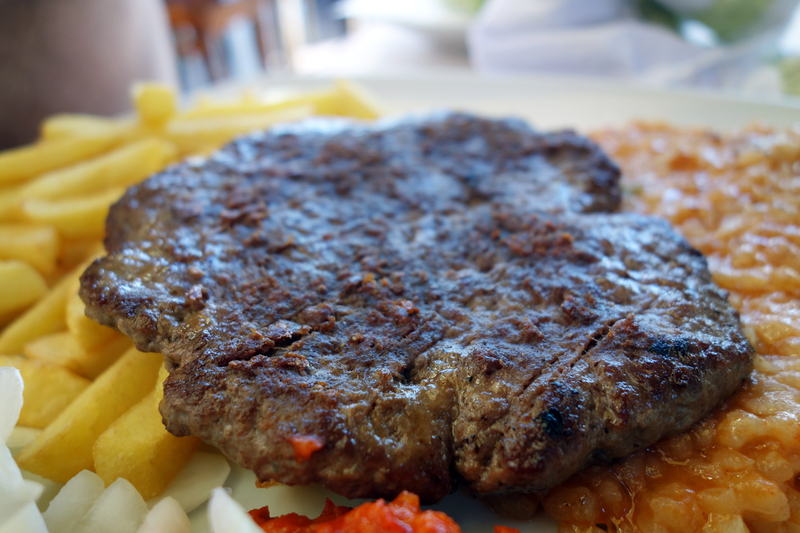 It can be served as a hamburger, between two slices of pita-type bread called lepinje or as a platter with grilled onions on the side. Condiments generally include ajvar and/or kaymak, which is a creamy cheese produced in the Balkans. As Portorož is a tourist town where Slovenes like to take their time even with their fast food, we could only find Pljeskavica in platter form. At Pizzeria Paco by the beach it is served with ajvar (of course…), chopped white onion, french fries and risotto. The patty was seasoned well and charred to achieve a nice smoky flavor, but was perhaps a bit too dry for my liking. My brother agreed, assuring me that it’s usually juicier and that we were just dealt an unfortunate hand this time around. The onions and ajvar were spot on as always and I appreciated the addition of the risotto even if it did not make too much sense with french fries already served as the side. We actually ended up enjoying the risotto the most out of this dish. It was moist and creamy with just enough bite and had plenty of flavor from paprika and black pepper added. 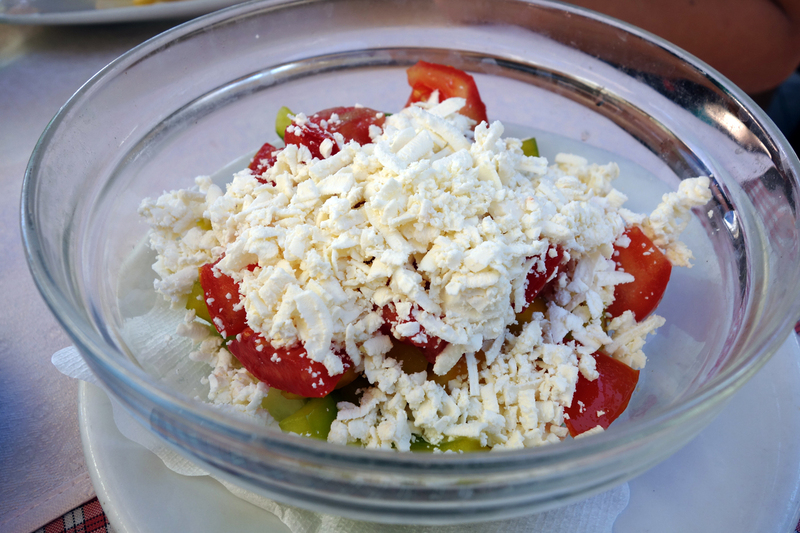 We also ordered a bowl of Šopska salata, which is a cold veggie salad popular throughout the Balkans and Central Europe. We have it in Hungary too and my grandmother makes it occasionally for family gatherings at her house. It’s relatively simple but immensely refreshing and perfect on a hot summer day, especially when served with grilled meat. Tomatoes, cucumbers, peppers and onions are diced and salted, then topped with grated sirene cheese. The latter is a crumbly and acidic brine cheese made with cow’s milk, similar to feta or cotija. 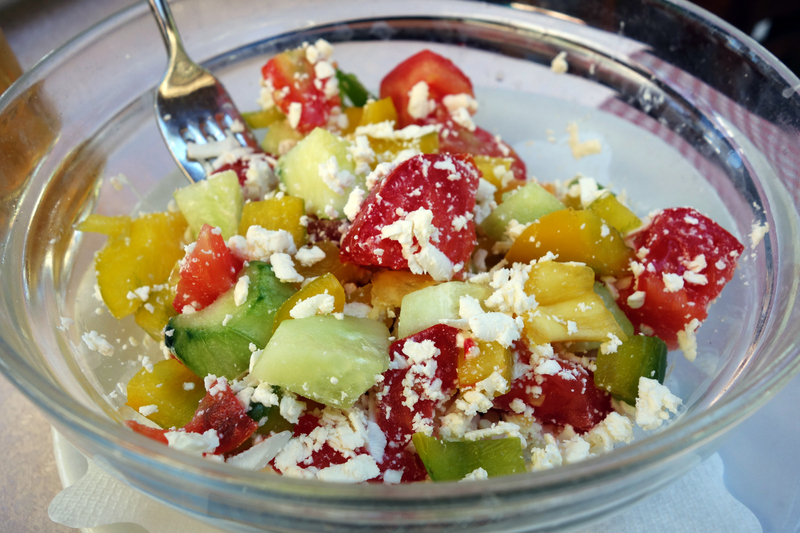 Paco, like most restaurants, serves its Šopska in a clear bowl with olive oil and white/red wine vinegar on the side for guests to add to their liking. I tend to add quite a bit of red wine vinegar and only a touch of olive oil. The salad is crunchy and fresh, with a great balance of flavors. I could’ve probably spent the entire week by the beach living on this stuff alone. July 17, 2014 in SLOVENIA.